SANTA CRUZ — An Aptos resident who has been missing for nearly 27 years is now listed under “Unsolved Homicides” even though there has yet to be a break in the case. 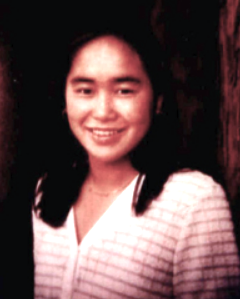 According to the Santa Cruz County Sheriff’s Office, Arlene Kazuko Tsuji, 25, who lived on Wilshire Drive, was kidnapped on Oct. 24, 1991 while taking her routine, early evening walk in the Vienna Woods neighborhood near Cabrillo College. She was last seen wearing a long-sleeved, pull-over sweatshirt and black shorts, and is believed to have been wearing headphones. “She has not been seen or heard from since and is presumably deceased,” the office said. The California Department of Justice, however, still lists Tsuji as missing and provides additional details. Date of birth: April 13, 1966. Height: 5 feet. Weight: 103 pounds. Scars/marks/tattoo: Three piercings in left ear, two in right ear. Dental X-rays available: Yes. Tsuji was reported missing by her landlord, who was concerned because Tsuji kept to a set routine. Co-workers said that she was highly reliable and that there was no indication that she was upset or in any kind of trouble when she left work for the last time. Sheriff’s deputies and volunteers, aided by search-and-rescue dogs, combed the Vienna Woods area and went door-to-door in the neighborhood but found nothing. Investigators also read her diaries to determine if she was despondent or was being threatened by someone.